Stoneridge Resort provides everything you need for the perfect family escape. Our 24,000 sq ft. Recreation Center is quite unique. Our hardwood floor gymnasium sports a full basketball court. Enjoy our workout room with weights, weight machines, and a variety of exercise equipment. The indoor saltwater pool with an outdoor patio is one of our most popular amenities. Water Aerobics classes are offered several days a week. Men's and Women's Dry Saunas are located just off the locker rooms. Our hot tub comfortably seats 12 with a eucalyptus steam room only steps away. Upstairs, you'll find the Loft Great Room with a pool table, an honor library, media area plus a full sized kitchen that is available for your use. Racquets, fishing poles, cross country skis and snowshoes are offered free of charge. There is a small fee for bicycle rentals. The three outside tennis courts are also used for pickleball during the summer. 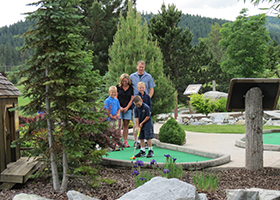 Our one of a kind, Panhandle Loop Mini Golf Course boasts 19 holes and introduces you to the Idaho Panhandle in a unique way. Each hole on the course represents a historic site that can be found on a matching historic drive around north Idaho's Panhandle. Each hole is accompanied by an interpretive sign describing that region's historic or geographical significance. We offer an associated map so that you can drive all or part of the 275 mile historic loop at your leisure. There is a small usage fee for the mini golf course. A playground and picnic shelter are available at the resort. The picnic shelter can seat up to 300 people and is often used for family get-togethers, reunions, and other special events on a first come, first served basis. Enter your email below to receive updates and specials.